San Francisco Bay in Northern California is one of the largest and most altered estuaries within the United States. The sea floor within the bay as well as at its entrance is constantly changing due to strong tidal currents, aggregate mining, dredge disposal, and the creation of new land using artificial fill. Understanding this dynamic sea floor is critical for addressing local environmental issues, which include defining pollution transport pathways, deciphering tectonics, and identifying benthic habitats. Mapping commercial interests such as safe ship navigation and dredge disposal is also significantly aided by such understanding. Over the past decade, the U.S. Geological Survey (USGS), the National Oceanic and Atmospheric Administration (NOAA), and California State University, Monterey Bay (CSUMB) in cooperation with the U.S. Army Corps of Engineers (USACOE) and the Center for Integrative Coastal Observation, Research and Education (CICORE) have partnered to map central San Francisco Bay and its entrance under the Golden Gate Bridge using multibeam echosounders. These sonar systems can continuously map to produce 100 percent coverage of the sea floor at meter-scale resolution and thus produce an unprecedented view of the floor of the bay. 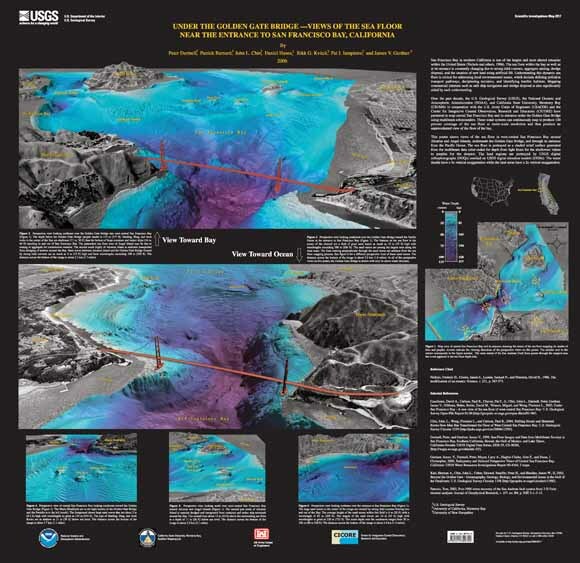 This poster shows views of the sea floor in west-central San Francisco Bay around Alcatraz and Angel Islands, underneath the Golden Gate Bridge, and through its entrance from the Pacific Ocean. The sea floor is portrayed as a shaded relief surface generated from the multibeam data color-coded for depth from light blues for the shallowest values to purples for the deepest. The land regions are portrayed by USGS digital orthophotographs (DOQs) overlaid on USGS digital elevation models (DEMs). The water depths have a 4x vertical exaggeration while the land areas have a 2x vertical exaggeration.